By Danny Emerman and Sam Shikora. By now you have seen the signs scattered around Sharon, planted in front lawns like flowers. The signs boast two candidates with vastly different views, both bidding for a role in the town’s government. 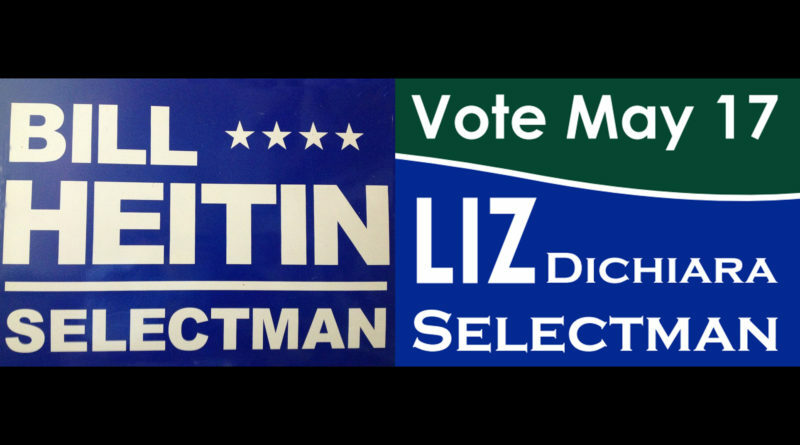 Newcomer Liz Dichiara poses a threat to longtime Selectman Bill Heitin in the selectman race. Dichiara says that an advantage she has over her opponent is her background in software and general work ethic as well as her ability to allocate significant time toward her campaign. “I am retired and have time to spend talking to more citizens and doing more research on issues. I have time to listen to all the stakeholders first and then decide,” Dichiara said. “I am a collaborative manager and person. I am from the software world and would use technology to include people in the big issues facing the town,” she added. Heitin says that his background in finance has directly affected Sharon’s economy during his tenure in office. As the only selectman with a financial management background, Heitin sees himself as a great asset to the town, since the majority of a selectman’s job is based on financial matters. The selectmen are in charge of the municipal part of the government — police, fire, and department of public works — and control 24% of the town’s budget. Heitin says that he has helped bring stability to the town’s economy by increasing the affordable housing stock from 3% to 10%, significantly improving Sharon’s bond rating, and generally reducing the debt burden. With this improved financial stability, Heitin says the town is able to reserve more funds for future projects. Both Heitin and Dichiara prioritize the high school. “We need to bring Town Hall and the Library into the 21st century and renovate the High School, which should be our first priority,” Heitin said. “We need to revitalize the Town’s athletic fields. We need to embrace a town-wide planning process to ensure that we can continue to manage growth within the Town and preserve open space. And we need to do all this while continuing to keep the tax burden stable,” he continued. Heitin has also discussed building a structure at the Sharon Train Station to allow for more parking and less traffic. Dichiara’s campaign is centered on her opposition to the proposed Spectra Gas Pipeline. “My run for selectman started when I was on the No Spectra gas pipeline and was frustrated that only one selectman of three would listen to us. I wanted to ‘be the change I wished to see’ and dared myself to run. I have learned a lot and have met many more great people in town. I plan to remain teachable and courageous for things I believe in,” Dichiara said. “It’s an expensive, dangerous, unnecessary thing that the town voted to oppose at the 5/3/16 Town Meeting. It is indicative of who I am, but it is one of many issues that is challenging our town,” she added. Heitin and Dichiara agree that local government plays a pivotal role in the lives of Sharon residents. “Local government can have the most direct benefit or impact on residents more than any other form of government,” Heitin said. “Open town meeting is the oldest form of government in the country,” Dichiara said. “It is raw democracy. The “selected men” – or women – need to run the town and the open town meeting in a transparent, open, supportive manner,” she continued.